On my way to work this morning I saw this fragment of litter lying on the ground. Obviously, it’s the outside edge of continuous-feed printer paper. Anyone younger than thirty may not know what that is, so here’s a photo for reference. 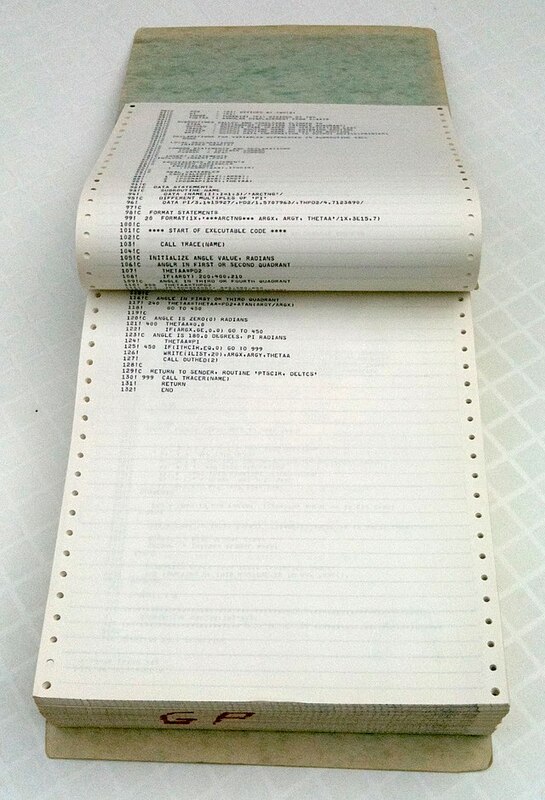 This kind of paper was extremely common in the dot-matrix era of computing. The edge holes fit onto sprocket wheels on the printer, and the paper came in a fan-folded pile that fed continuously through the printer as those sprocket wheels turned. The paper was perforated at the fan folds and along the edges. Once you had your printout, you could tear the sheets off of the printer, separate the pages, and remove the edges with sprocket holes. Et voilà! You had a document that looked somewhat similar to a typewritten document, depending on how many pins your printer had. 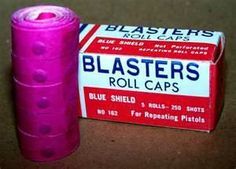 For some reason, when I saw that strip of paper with sprocket holes this morning, I flashed back to the strips of toy gun caps we used to play with when we were kids. Because anyone younger than about forty may never have played with these, below is a photo for reference. The “caps” were tiny embedded pockets of powder spaced at regular intervals and sealed into long, thin paper strips. The strips came in rolls and sold in little “ammunition” boxes. You were supposed load the roll into a toy pistol. Then every time you squeezed the trigger, the strip of caps would advance so that the hammer could strike a fresh pocket of powder to create a somewhat frightening facsimile of a real gunshot, with a loud bang, tiny sparks, and a puff of smoke. None of us had a toy gun, so I’m not sure how we came by the rolls of caps. Some of the neighborhood kids apparently had access because there were always plenty of caps to play with. We’d unroll a strip on the sidewalk and then use a rock to strike the individual cap pockets. We would blow through those rolls of caps pretty quickly, leaving behind bedraggled strips of paper with charred circles at regular intervals. This entry was posted in History, Life, Popular culture and tagged childhood, continuous feed printer paper, nostalgia, printer paper, roll caps, sprocket holes, sprocket wheels, toy guns. Bookmark the permalink. 5 Responses to Bang! Bang! Bang! Kathleen, I happened across your blog on my way to something else a few days ago. I stopped in and decided to sign up and see if I liked your stuff. Love it! One request, though. I would rather get your posts in Facebook but I only see you on Twitter? Thank you so much!!! (for liking my blog 🙂 ) Your comment has persuaded me that it’s time to get a Facebook account. I’m very late to that party and have resisted it for a long time. Why? Mostly because I’ve heard so many people say that Facebook makes them hate their friends. But it occurs to me now that maybe Facebook is not the problem. After all it’s just a tool. And I’ve noticed that my blog gets the most views on days that people share posts on Facebook. I’ll get at least a rudimentary Facebook account up over the weekend so you can subscribe in the reader stream you prefer. Truly, thank you for sharing your request for Facebook access with me. Who knows how many other people may have had the exact same thought but not said anything! I love these little views into your day, Katie! And I remember both of these things.